WASHINGTON — Growing up in Alexandria, Egypt, Yomna Ahmed Rageb remembers a childhood full of Legos. So when her parents suggested she get involved with robotics, it felt natural to trade her plastic bricks for metal gears. Now, eight years later, Rageb is one of 830 teenagers, including 209 girls, looking to the future as they showed off their robotics skills in Washington D.C. over the past three days at the inaugural FIRST Global Challenge. 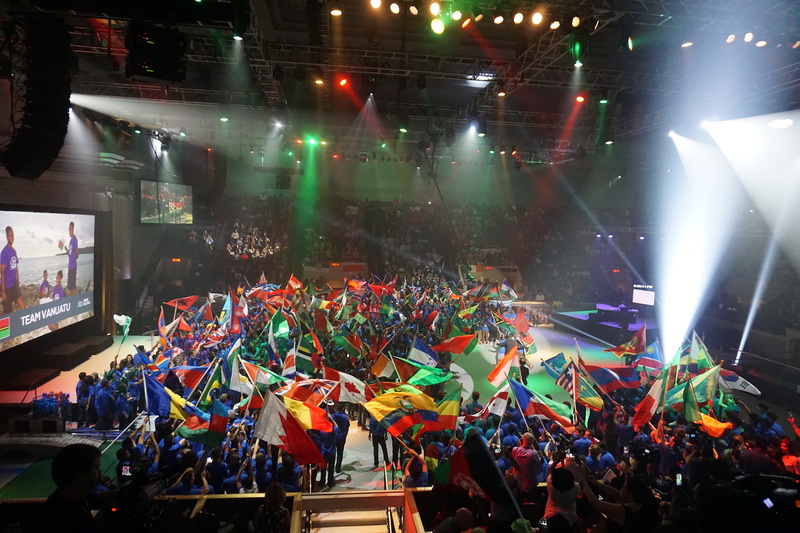 FIRST Global, a US-based nonprofit, engages high school students worldwide in an ‘Olympics’-style robotics competition. 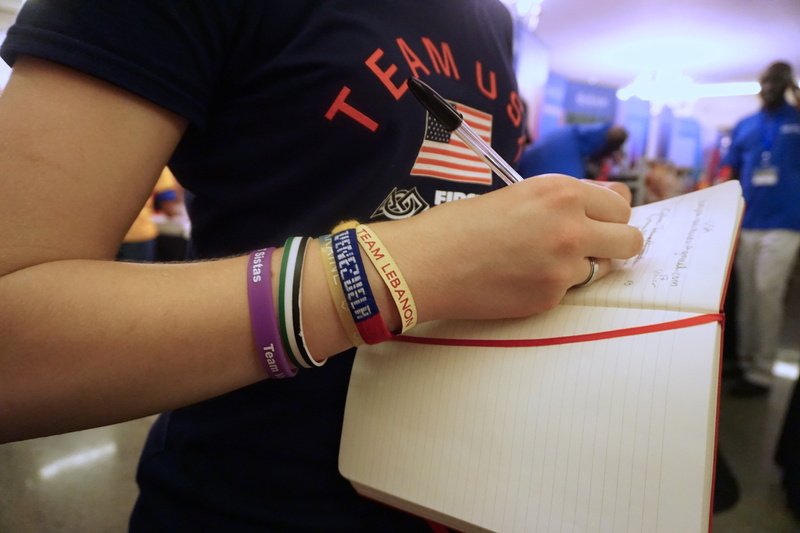 Each yearly tournament will have a different theme selected from the 14 Grand Challenges of Engineering, a list of pressing issues identified by national engineering academies in the United States, United Kingdom, and China. This year’s theme was access to clean water, and the students competed to create the most efficient robotic purification system. Each team received a box of parts in March, with which they had to build a robot; no outside equipment was allowed. In lieu of getting wet, the robots sorted beach balls: blue (clean) and orange (contaminated) to prove their filtration capabilities. Rageb’s story is a familiar one to many young women with an interest in science, technology, engineering and mathematics (STEM), both when they’re first starting out and later as they try to enter the workforce. FIRST Global says 60 percent of the 157 teams were organized or led by women, and though 25 percent of FIRST Global’s challenge participants were girls, only six teams were comprised of all-girls. The statistics for the competition mirror worldwide data: according to UNESCO, only 28.8 percent of STEM researchers are women, even though more women hold Bachelor’s and Master’s degrees than men. In the United States, the National Girls Collaborative Project found that women account for 15 percent of the engineering workforce, despite holding 50.3 percent of science and engineering degrees. Last year, in a UNESCO survey of 110 countries, the data revealed that 44 percent of women went on to receive doctorates in STEM fields — almost identical to what UNESCO found in 2008, which points to a stagnation that bears recognition and resolution. In Alatt’s home country, a 2015 UNESCO report found that only 32 percent of women 15 years and older are literate, compared to 62 percent of men in the same age range. While 77 percent of girls enrolled in primary school end up attending secondary school as well, the women all but disappear from Liberia’s statistics on higher education. “I feel that science, technology, engineering and mathematics are the key tools to change the world,” she explains, leaning over her team’s table. Their robot, crowned with a tiny Liberian flag, rests beside her. Alatt dreams of becoming a computer engineer, and she says that participating in a STEM event on a global scale has only increased her ambitions, adding that she’s “delighted” that she’s seen so many girls involved. For many of the participants, the challenge of providing access to potable water resonated strongly. Women in Africa bear 90 percent of the responsibility when it comes to gathering water, in some countries walking an average of an hour to find a safe source, according to the United Nations. For young girls this often takes time away from education. Globally, 884 million people still lack access to a basic drinking water source, while over 2 billion drink water that has been contaminated by feces, according to the World Health Organization. Due to factors like climate change and population growth, half of the world will live in water-stressed areas by 2025. Engineering innovations like desalination and recycling wastewater will likely be key in addressing water scarcity. Proudly sporting a pin with the words #LikeAGirl, Owu is one of six members of Ghana’s all-girl team from the Archbishop Porter Girls Secondary School in Takoradi. Wearing brightly colored traditional tunics, the girls are proud of their presence as one of the few fully female teams. Although 40 percent of girls in Ghana still lack access to secondary school, their enrollment numbers are quickly gaining on the boys, according to a report by UNESCO. However, the gap is large when it comes to female participation in STEM, UNESCO says, citing a Ghana school district where of the 855 girls enrolled in high school only 29 are pursuing STEM subjects. 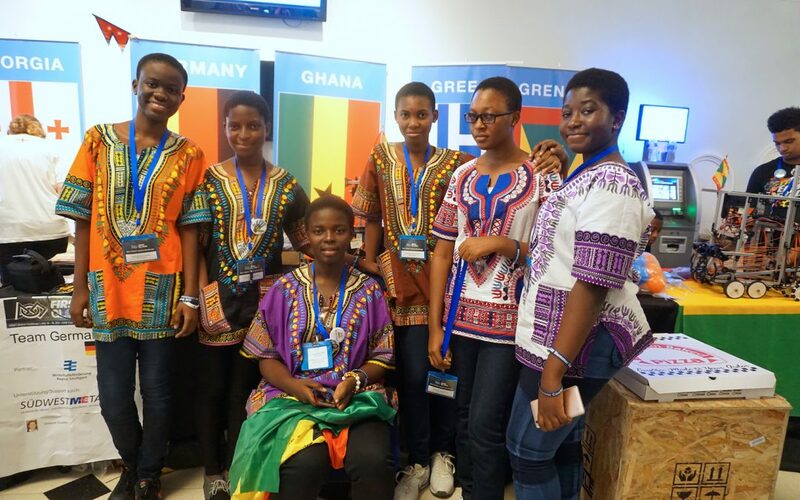 Koomson hopes that her team’s presence at the robotics competition will help raise awareness that girls can be involved in STEM — and have fun doing it. Six-thousand miles away from Takoradi, the girls of Team USA share a similar love of robotics — the product of a very different upbringing. As she cools-down in front of the Team USA table after their latest game, Sanjna Ravichandar is awash with enthusiasm. Ravichandar, 17, says she and her teammates have had a lot of positive female role models and now they hope to be the same for other girls. Ravichandar cites Margaret Hamilton and Ada Lovelace as well as the female software engineers she met living in Plainsboro, New Jersey, as her biggest motivators to pursue a career in STEM. “We’re really thrilled to be an all-girls team, even though it was totally incidental,” Ravichandar says. Earlier that morning, Team USA held a friendly match with the other five all-girls teams to kickstart the final day; Ivanka Trump was one of the attendees at the exhibition game. Ravichandar’s teammates Colleen and Katie Johnson grew up in Fairbanks, Alaska, as the daughters of two very robotics-oriented parents. The girls entered FIRST challenges when Katie was eight and Colleen was 10, and have participated in robotics events together ever since. Colleen, a graduating senior, remembers playing with robots since she was “knee-high.” Now, after eight years of robotics challenges, she says that meeting fellow passionate young women from around the world is the best send-off she could have. “It was so inspiring to get to see these all-girls teams from around the world and get to be a part of something like that,” Colleen says. Twelve-year-old New Zealander Vanshikha Ram may be one of the youngest participants, and she’s just getting started with the robotics scene.